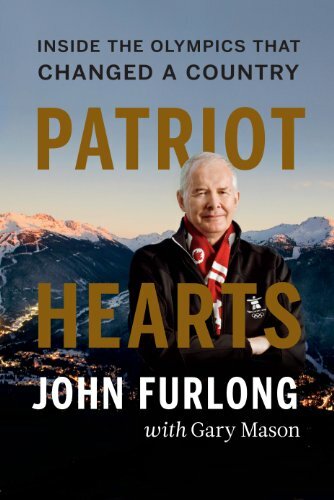 At long last I have read John Furlong's Olympic memoirs. The Vancouver Olympic Committee headman has - with the help of the gifted Gary Mason - penned his autobiography - Patriot Hearts: Inside the Olympics that Changed a Country . Though the book opens with the game's crowning moment - the men's hockey gold medal game - the book is not really a hockey book. Still, it is a great read for anyone looking to relive the 2010 Olympics, as well as learn how it all came to be. It is a pretty amazing behind-the-scenes look at "the Olympics that changed a nation." Furlong is an amazing visionary and an amazing leader. Right from the start he led his Olympic Committee team not with the purpose of putting on a show, but with the grander goal of nation building. Despite many challenges, they accomplished their goal magnificently. This book obviously appeals to Olympic sports fans and proud Canadians. But you almost could include this book in the business section of your favorite book store. The book is an inspirational guide on such topics as leadership, motivation and problem solving. How Furlong managed arguably the biggest project ever undertaken in Canadian history is something MBA students will be studying for years to come, I'm sure. That is the biggest thing I took from this book, but I enjoy such studies. I really enjoyed the trips down memory lane, but it is Furlong's vision and leadership skills that wow me. A riveting behind-the-scenes account of the transformative Vancouver 2010 Olympic and Paralympic Games -- an extraordinary story of visionary leadership, love of country and the ability to dream boldly. When John Furlong emigrated from Ireland in 1974, the customs officer greeted him with "Welcome to Canada. Make us better" -- an imperative that has defined Furlong's life ever since. A passionate, accomplished athlete with a track record of community service, Furlong was a volunteer for Vancouver's 2010 Olympic bid movement when it began in 1996 and then spent the next 14 years living and breathing the Olympics. Furlong and his organizing team, including 25,000 volunteers and many partners, orchestrated a remarkable Winter Games. Patriot Hearts is the story of how they did it. Working with Globe and Mail columnist Gary Mason, Furlong recounts the lead-up to the Games and describes how he handled seemingly insurmountable setbacks -- such as the death of Georgian luger Nodar Kumaritashvili, a global recession and the washed-out snow at Cypress Bowl -- to achieve a runaway success and, ultimately, a pivotal moment of nationhood. Patriot Hearts will be published on February 12, 2011, the anniversary of the 2010 Olympic opening ceremonies. Furlong will donate part of his book royalties to the Own the Podium program.